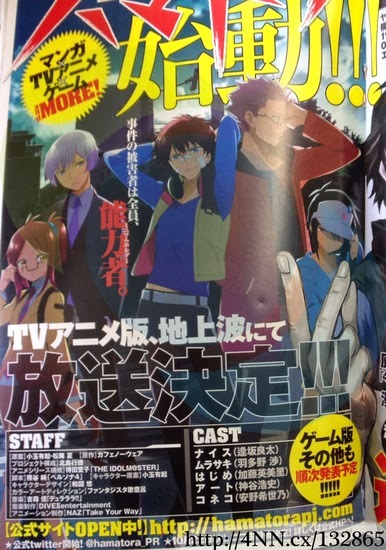 Desde la fantastica RAMEN PARA DOS leemos lo siguiente: En el número 44 de la revista Young Jump se anuncia que el proyecto de Hamatora se encuentra ya en marcha, una idea orignal destinada tanto para manga, anime y videojuego. El primer en ver la luz será la versión manga en el número 51 de la revista de Shueisha, una historia de acción y misterio escrita por Yukinori Kitajima (428 ~Fūsa Sareta Shibuya de~, Senran Kagura, Professor Layton vs. Phoenix Wright: Ace Attorney) y que contará con el dibujo de Yūki Kodama, autora del manga de Blood Lad. Artículo siguienteFOX lanza los nuevos webisodes del universo de The Walking Dead como aperitivo de la cuarta temporada. Throughout the great pattern of things you get a B- for effort. Where you misplaced everybody was in the particulars. You know, it is said, details make or break the argument.. And that could not be more true right here. Having said that, permit me reveal to you precisely what did deliver the results. Your writing is actually incredibly persuasive and this is probably the reason why I am taking the effort in order to comment. I do not really make it a regular habit of doing that. Secondly, while I can see a jumps in logic you make, I am definitely not certain of how you seem to unite the details which make the conclusion. For the moment I shall subscribe to your position but hope in the future you link your facts better. In the great scheme of things you receive a B+ for hard work. Exactly where you lost us was first on all the details. You know, they say, the devil is in the details… And it couldn’t be more accurate here. Having said that, let me reveal to you just what did work. Your writing is really engaging and that is probably why I am taking the effort in order to comment. I do not really make it a regular habit of doing that. 2nd, despite the fact that I can certainly notice the jumps in logic you make, I am not convinced of how you appear to connect your details which make the actual conclusion. For right now I will yield to your issue however hope in the near future you connect your dots much better.